This simple tool allows Chinese teachers and parents to quickly create Pinyin practice sheets for Chinese learners who haven't started learning Chinese characters. 4. Create a blank practice row for each Pinyin entry. Enter the title of the vocab list, such as My Family. The title is used to identify the vocab list and it is required to save the list to the server for future use. Optionally, enter the Chinese characters or words. Optionally, enter the definition of the Chinese character or word. Click the Add Rows button to add more rows if needed. Optionaly, adjust Pinyin practice sheet maker settings, such as grid size, grid color, etc. 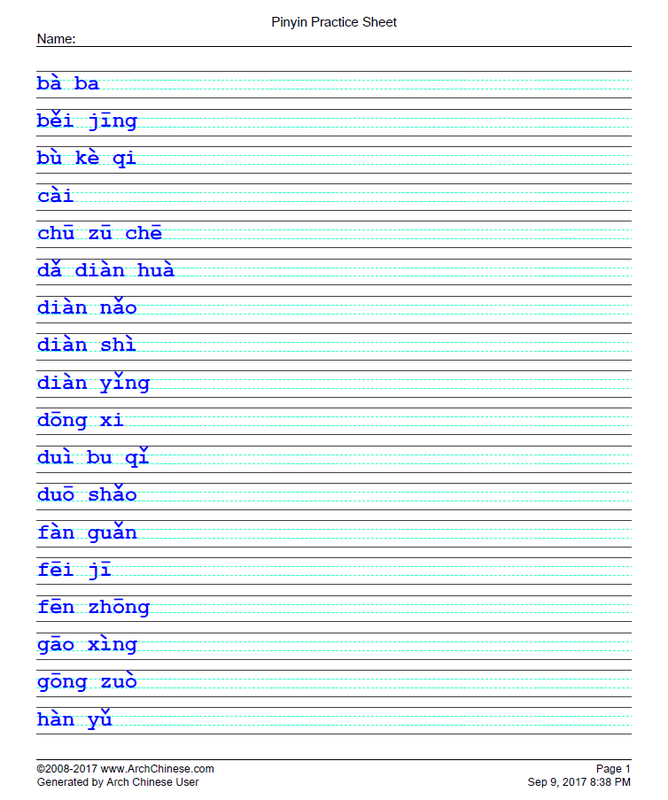 Click the Print button to generate the Pinyin practice sheets. Optionally, click the Save button to save the vocab list for future use.